Prototype: German Federal Railroad (DB) class 98.3 "Glaskasten" / "Glass Box" (former Bavarian class PtL 2/2) without a jackshaft. The locomotive looks as it did around 1952. 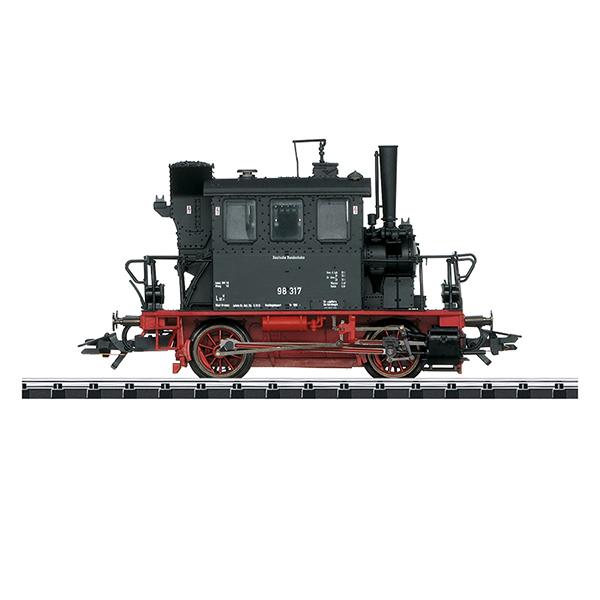 Model: The locomotive has a digital decoder (DCC/mfx). It also has a miniature motor in the boiler. 2 axles powered. Traction tires. The dual headlights change over with the direction of travel, will work in conventional operation, and can be controlled digitally. The locomotive has a buffer capacitor. The inner boiler is constructed of metal. The locomotive has numerous separately applied handrails and grab irons. The boiler parts and other details are finely reproduced. Length over the buffers 8.0 cm / 3-1/8".